Voters will chime in on a special election this month. Homelessness and affordable housing — these are two major issues in cities all across the Bay Area. They're also the central focus for the two candidates vying for an open seat on Berkeley's city council, part of this month's special election. Candidate Ben Gould, a UC Berkeley graduate student studying public policy and environmental engineering who is set to graduate in May, says the downtown area "is hit the hardest by the homelessness crisis" in the city. His opponent, candidate Kate Harrison, co-founder of the Berkeley Progressive Alliance, says more long-term solutions must be implemented. The two candidates differ, however, when it comes to solutions. Harrison supports city-sanctioned but self-governed tent cities, complete with sanitation facilities and health services. Gould, however, says encampments "criminalize" homeless people and aren't safe options for women and children. He supports the increased availability of homeless shelters, and the scaling of available services to include other area cities. "A regional housing plan could be a lasting solution," he said. Voters in District 4 already have begun casting ballots in the contest. While some political campaigns can last for years, the race for this seat is only about three months long. The special election was called in December, after then-Councilmember Jesse Arreguín was elected to the mayor's office. Voting will be done entirely by mail, and the deadline is March 7. The election, consisting of approximately 9,000 voters, is anticipated to cost $158,500, according to city documents. Compared to other city council battles, there's not much money in this race so far. Harrison raised $15,397 for her campaign, as of most recent statements, and Gould $8,504 for his by the end of 2016. Gould, who also ran for the mayor's seat in 2016, reported raising $9,135 for that campaign. Besides nearly twice as much in her campaign coffers, another feather in Harrison's cap is the endorsement from Arreguín himself. Gould acknowledges he's the underdog in the race, even with endorsements from two city council members and state Sen. Nancy Skinner, the only person to be elected to city council while a UC Berkeley student. When it comes to issues affecting downtown Berkeley, John Caner, CEO of the Downtown Berkeley Association business-improvement district, said he's mostly focused on who is occupying the sidewalks. "The biggest concern is the problematic street behavior," he said. "It's not healthy for people to be living on the sidewalk." While not all homeless people are a problem, he said, people who play loud music, use drugs, or engage in aggressive panhandling can be intimidating to people new to the area. Others, he said, are used to it. The current city council is currently working through an ordinance that regulates protections and right-of-ways on sidewalks, such as protecting dogs and insulating material used to sit on such as blankets, cushions, or mats. Caner also expressed concerns about protests. He cited the half-a-million dollars in property damage to downtown businesses, because of protestors objecting to "alt-right" voice and Breitbart.com editor Milo Yiannopoulos, who was scheduled to speak at the UC Berkeley campus earlier this month. This protest spilled into the downtown streets, and members of a "Black Bloc" contingent smashed storefront windows and set ATMs on fire. Protestors were not quelled by Berkeley police. The incident, Caner said, was reminiscent of protests in the 1960s, which caused some downtown businesses, such as Bank of America on Telegraph Avenue, to be redesigned into brick "fortresses," he said. The general consensus of downtown business owners, he said, is that they respect Berkeley's full support of free speech — but don't want a tradition of protest to allow "wanton destruction." "A lot of property owners and managers are asking what's being done when these anarchists are running amok downtown," he said. Harrison says Berkeley police need to reform their crowd-control policies to better handle incidents in the future. Other issues at play in downtown is the limited availability of parking, increased rents for small businesses along major corridors like Shattuck Avenue, and improving alternative transportation resources, like adding more bike lanes. In addition to downtown issues, votes at the Berkeley council, as history has shown, can reverberate in cities across the Bay Area — and possibly the country. 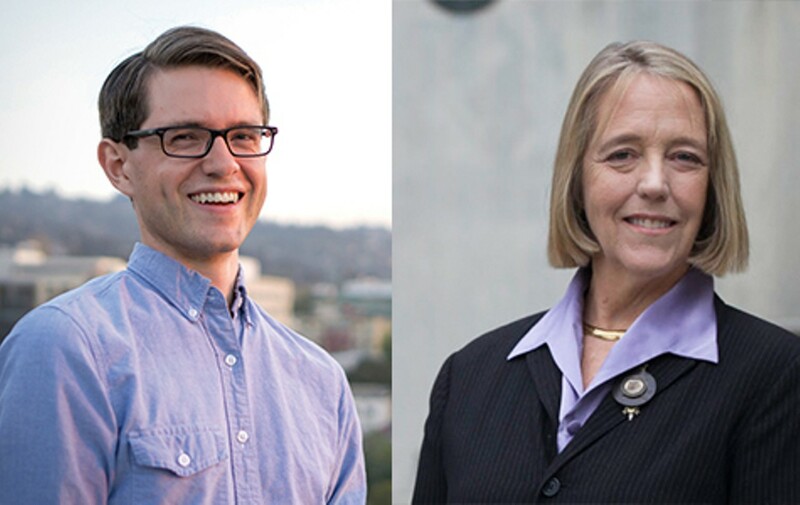 Both District 4 candidates agree Berkeley can be a leader in regional programs, and that the city leadership can offer more lasting solutions, such as the development of more affordable-housing options in the city while not stymieing other development. One such issue in existentially progressive Berkeley is the resistance of President Trump, and policies that affect both the entire nation and also the city — including but not limited to health care, human rights, the freedom of the press, and protecting refugees. "Berkeley has the reputation of being at the forefront of issues, but we can't do it alone," Harrison said. "I really believe this is going to be a collaborative effort between local and state governments."